Buy Less Mess premium topsoil, mulch, sand, stone and compost to give your garden the best quality product with the added convenience of home delivery. Less Mess delivery saves you the pain and inconvenience of having to lug bags of topsoil, mulch, compost, sand and stone home from your local nursery. 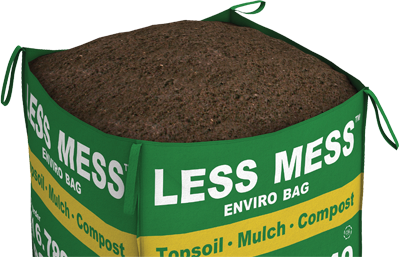 Simply use the amount of topsoil, mulch, sand, stone and compost you need, and the re-sealable Less Mess bag closure lets you save the rest for later.